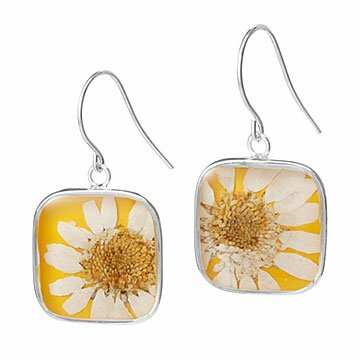 Fete a birthday with the wearable birth month bouquets of these dried flower earrings. An unknown author once wrote, "Happiness held is the seed; Happiness shared is the flower." Sharing the natural beauty of these earrings is a fresh way to honor a special relationship, whether it has grown and blossomed your whole life, or for only a month. Each month of the year has a particular flower associated with it—and these blossoms, though real, never fade. Sourced from around the world, each dried and pressed flower is picked for its delicate beauty by Shari Dixon, and showcased beneath clear resin. Set in a silver-plated brass bezel, each hangs from a sterling silver wire. A pair of earrings containing someone's birth flower makes a unique and graceful gift—or simply pick one because it's lovely, no matter when your birth date is. Handmade in Tennessee. Each pair sold individually. Please check out our Birth Month Flower Necklaces and Birth Month Flower Cuffsfrom Shari Dixon. Wipe with a silver cloth. She loved it, so I love it! I lost one earring as the backing did not secure the earring. I emailed to find how to order a replacement. Uncommon Goods quickly sent me a new pair & did not even charge me for postage. Unbelievable service. Gorgeous jewelry. Thank You. My wife loves them. Very personalized for her. This just fit the bill for a Valentines Day gift! I'm out of the Doghouse!!! All my friends' birthdays are covered! These are nice wight and quality earrings. The pressed flowers add a very pretty and unique dash of color. It was a gift for my daughter-in-law. my wife loved the birth month flower ear rings and necklace.